I stayed in a Little Mermaid room at Art of Animation in September 2012, two weeks after the official opening of the Little Mermaid Section. Note: The pictures here and in my Sept/Oct 2012 Trip Report are identical. The trip report has more of a personal view of Art of Animation (mostly in part 2, but is really scattered through the report), this page has more of an analytical view. As of my writing this (October 2012), Disney's Art of Animation Value Resort is the newest resort on Disney World property. It is the sort-of-a sister resort to Pop Century. But then came September 11, 2001, and tourism stopped. Pop Century, the Classic Years, was to have opened in 2001. Its opening was postponed twice, and eventually opened on December 14, 2003. All construction ceased on the Legendary Years, and for years, sat empty and unfinished in plain sight across Hourglass Lake. They would take the prior construction of the Legendary Years, and use it as the foundation for the new resort. Art of Animation would take four already-well established themes as its source: Cars, Finding Nemo, The Lion King and The Little Mermaid. Because of the amount of construction already done on buildings 7, 8 and 9, they would open as normal value rooms, but buildings 1-6 and 10 would be converted to family suites. F is the floor. 1-4 are in Pop Century, 5-8 (where 5 is the first floor, 6 is the second, etc.) is in Art of Animation. NN is the room number on that floor. One of my rooms was Room 9618. Building 9, second floor in Art of Animation, room 18. Note that all of Pop Century and Art of Animation share the same room number space, probably an artifact from the original plans, concept and software. There are several other shared features. If you look at an overhead map (one is below), the main resort building and buildings 1-6 and 10 are identical between the two resorts, just turned 180 degrees from each other. Buildings 7,8 and 9 are a different matter, however, which we will get to later. The Main Complex is known as Animation Hall. It holds Registration, Ink and Paint (the resort gift shop), Pixel Play Arcade (the resort game room) and Landscape of Flavors (the counter service and only restaurant on property). The bus stops are just outside the front entrance. My main complaint about the All-Stars registration has been fixed here. Registration, guest services, etc, are in a very large comfortable area, missing the contrasty and loud colors that adorn Sports and Music. The backlit concept art brightens the area, and the indirect lighting makes for a more friendly atmosphere. Landscape of Flavors is the solitary restaurant choice at Art of Animation. It has very good looking menu choices on paper, and we actually looked forward to eating there. However, it lost something in execution between looking at the menu on a web site, and actually being served those items. First, however, let me say that Landscape of Flavors is very well themed. It is loosely grouped into four main seating areas (each area themed to the main themes of the resort), the food court area, with three beverage islands. There are a few problems with the restaurant. The restaurant is loud. Granted, you could have a thousand guests in the restaurant at any one time, but Disney should have installed more sound absorbing material. The food court is divided into five "stations", each station serving a particular kind of food, depending on whether breakfast, lunch or dinner was being served. If you're going to get something from two different stations, you really do need two people to do it. Since the lines move so slowly, the food received from one station will be cold by the time you get food from the second station. 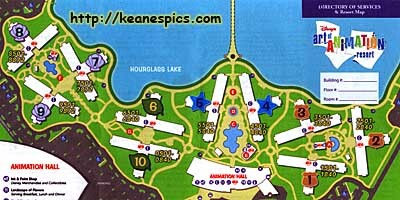 Overhead map of Art of Animation (left of Hourglass lake) and Pop Century (on the right). 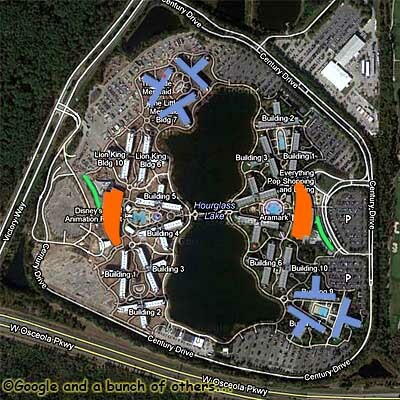 The Lobby/Food Court is in orange, the bus stops in green. Buildings 7, 8 and 9 in blue, which are the Little Mermaid Rooms at AoA. The red dot is where our rooms were. I stayed in the Little Mermaid section (Buildings 7,8,9) and had a few problems. Cell phone reception was non-existent in the rooms. If you needed to make a call, you had to leave the room. Even if you had to send a text message, you had to hold the phone right next to the window or it would fail. That's unacceptable these days. The really bad part of being in the Mermaid section, was the walk to/from Animation Hall and the room. If you look at the map on the right, buildings 7, 8 and 9 curve toward the bus stops at Pop Century. At Art of Animation, they follow the lake, which takes them a considerable amount of distance away. So if you stay at a value room at Art of Animation, you will have a considerable walk from the room to the bus stops or food court. There are no close value rooms, only suites. Before you say I'm whining, whether you follow the parking lot (shortest route to the bus stops) or through Lion King (shortest route to the food court) there are long stretches of unprotected walkway, where you get broiled in the hot Florida sun, or soaked in the drenching Florida rain. If you have a car, you will learn to use it. The key cards are RFID, and only need to be touched to the lock on the doors to get a green light. I found if you keep it on an outside pocket of your wallet, you could just touch your wallet to the door lock to unlock the door. There are widescreen HDTV's with a dedicated I/O panel (HDMI, VGA and composite). In the same TV stand is a refrigerator, leaving space for three not-too-big drawers. Also of note, coffee makers are not standard amenities at value rooms. I brought my own. The guest population of Art of Animation did, after all, almost double two weeks prior to my arrival. So there's a lot of new staff, and a new area of the resort that hasn't been inhabited before. Still this isn't a new operation for Disney. Pop Century is an almost identical resort, which I assume runs more smoothly than Art of Animation.